There are countless decisions that we make every single day, from the moment we get up until we finally fall asleep again at the end of the day. Many decisions we don’t even notice just because they are small and ordinary. Some take more thought, such as what to wear or what to eat for meals. Jobs require a ton of decisions, from small to big. There are many questions to be answered. Time is limited, and we must decide how we will choose to use every bit of it. As parents, we are almost overwhelmed with the many decisions that we must make. I remember being almost overwhelmed with all the choices and decisions we had to make with just putting together our registry for a baby shower! An active parent must figure out how to continue being active after children are around. We have to figure out how we can fit it all into a day. Is the weather nice enough to push them in a stroller with us? What childcare options do I have if I want to go for a swim, or can’t take them with me on a run? Will I bike today during her nap? How much time will she give me? What type of workout will I do today? How will I structure my workouts for the week? What are my key workouts? Will the weather cooperate to go outside today? When will I fit in an open water swim? Do we need sunscreen today? Will it rain? Is it windy? What route should I take? Which shoes should I wear? Then there is the “fourth disciple” of triathlon – nutrition: what should I eat before, during, and/or after a workout? How much, and when? I mainly rely on water before and during a workout, unless it is 1.5-2 hours or so, then I also have Gatorade during. Since I am done with my half-iron training, I no longer use anything else. Recovery drinks have become more popular, and there are more and more options out there to choose from. 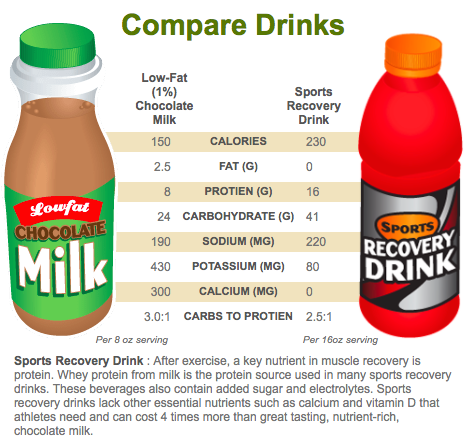 Many commercial or specialized sports drinks though often contain only carbs and electrolytes, but are missing the added benefit of protein that is naturally found in low-fat chocolate milk. 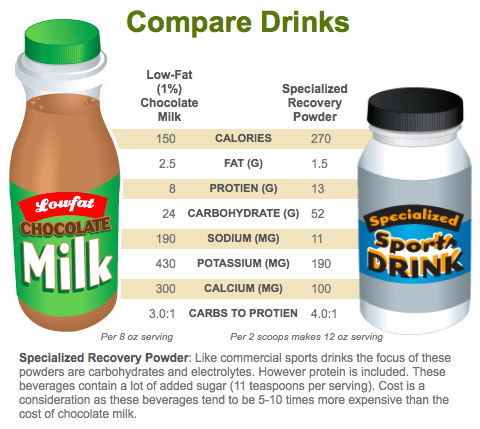 The added sugar in chocolate milk is tiny in comparison to sports drinks as well. You probably have seen or have heard of protein shakes/drinks that are all the rage. While protein is essential for rebuilding and repairing muscles after an intense workout, are these drinks then the way to go? Even looking at the aisle of all the different options in the store can be overwhelming. While all those powders and drinks contain a high amount of protein for sure, they also fall short in comparison to low-fat chocolate milk in multiple ways. First, chocolate milk naturally has the ideal ratio of carbohydrates to protein for rebuilding, repairing, and replenishing the body. Protein drinks are heavy on protein, but lacking when it comes to carbs, meaning that you’ll also have to intake carbs in addition to the protein shake. If you want to match the ideal ratio, then you’ll also have to do some math. On top of containing carbs and protein, chocolate milk is also the perfect balance of 9 essential nutrients needed for sports recovery, including calcium, potassium, sodium, and magnesium. Drinking low fat chocolate milk within 30 minutes of a completed workout not only promotes loss of excess body fat, it also promotes muscle mass gains, and maximizes overall performance. There is a product called Muscle Milk®, but does it actually contain milk? No! It should be labeled as a nutritional shake or a supplemental beverage. In fact, consumers are purchasing a water-based product that does not even contain milk. Its carb to protein ratio is 7:12, versus chocolate milk’s ideal ratio of 3.5:1. Looking online, it also costs $25 for a mere 15 servings, while chocolate milk is just a fraction of that cost. On top of that, it tastes great. A lot of protein powders and shakes taste chalky and can be hard to choke down. After a hard workout, chocolate milk goes down smooth and tastes so good! I also discovered this nice little warning on the container of Super Advanced Whey Protein: “Not intended for use by pregnant or nursing women. If you are taking any medications, consult your doctor before use. Avoid this product if you have kidney disease. Discontinue use and consult your doctor if any adverse reactions occur.” Hmm. I think I’ll pass. That is one label you’ll never have to worry about seeing on a chocolate milk container! We will encounter numerous choices throughout life, and endless decisions that we’ll have to make, in general, as a parent, and as an athlete. So when it comes to recovery, let’s just keep it simple: choose chocolate milk.